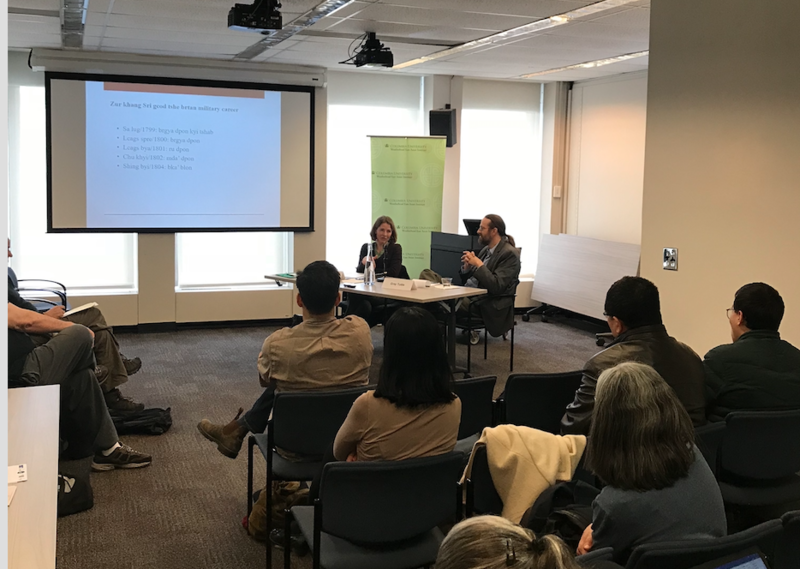 On March 28th, WEAI and the Modern Tibetan Studies Program hosted Alice Travers, a permanent researcher in the CNRS (French National Centre for Scientific Research) and a member of CRCAO (Centre for Research on East Asian Civilisations – UMR 8155) at the Collège de France in Paris. The talk was moderated by Professor Gray Tuttle. Dr. Alice Travers discussed the social history of 18th, 19th and 20th century Central Tibet and the Ganden Podrang government and its institutions as the Principal Investigator of the project, “The Tibetan Army of the Dalai Lamas, 1642-1959,” at the Sorbonne, Paris. During the eighth century, the Tibetan Empire (618-842) conquered a region encompassing sections of modern-day Afghanistan, India, Xinjiang (Eastern Turkistan), and parts of China proper, and its army made Tibet one of the major powers in Eurasia. Though the Tibetan military declined drastically after the collapse of the empire, military culture continued to influence Tibetan civil and religious society. Popular perception views Tibet as a passive agent, receiving Mongol and Manchu aid for military affairs. For instance, the current mainstream Chinese academic literature credits the Manchu general Fuk’anggan (1753-1796) for helping establish and train the Tibetan army after the Gurkha Wars ended in 1792. These assumptions, however, ignore the Ganden Podrang’s active pursuit of military and state-building deployment since its foundation.